Some years ago, I bought a collection which contained four unusual Chassepot proofs. They were single Die Proofs of the Eagle design but without figure of value. They were from Original rather than Reprint material and suggest that the figures of value were plugged into a single plate, and changed for the printing of each value. 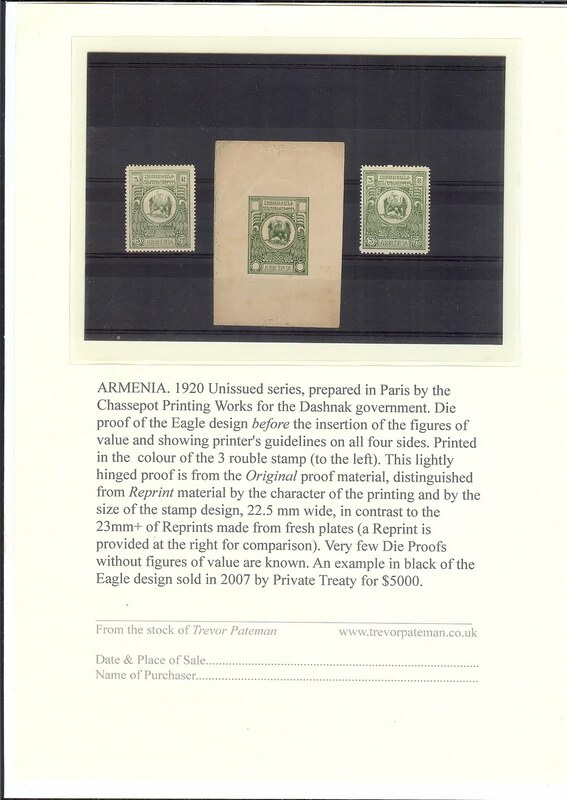 One of my Proofs was in black, and is now in a collection in Russia; one was in the issued blue colour of the 10r - I recently let this Proof go to a collection in Germany; one was in the issued brown colour of the 1r - this went to an English collection. Now I just have the Proof in the issued colour, green, of the 3r. The fact that three of the Proofs were in issued colours leads me to think that these Die Proofs must exist in all the issued colours - red and lilac in addition to those I have handled. My remaining example is illustrated below with a stamp from the Original printing on the left and a reprint on the right. Click on the image to enlarge it.